Russia and the US were once staunch allies in the struggle against the Axis, scholars and diplomats reminded the academic community at a symposium introducing a new institute for Russian culture and history. As chilly as relations might be between Washington and Moscow today, they were cordial seventy years ago as both countries endeavored to defeat Nazi Germany. 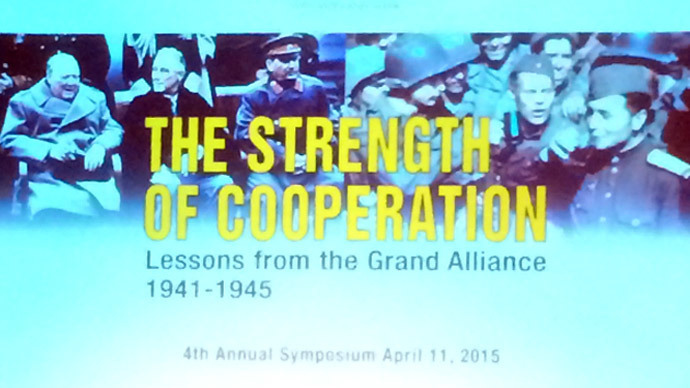 The hows and whys of the Grand Alliance were the subject of a fourth annual symposium at American University in Washington, DC, organized by the newly established Carmel Institute for Russian Culture and History. Four speakers at the symposium brought back the Grand Alliance in vivid imagery, with Iskander Magadeev of Moscow State Institute of International Relations (MGIMO) presenting the correspondence between Stalin and Franklin Delano Roosevelt, and University of Connecticut’s Frank Costigliola examining the impact of FDR’s death to the Alliance forged by personal diplomacy. Susan Eisenhower shared the stories of the unlikely friendship between her grandfather, general Dwight D. Eisenhower, and Marshal of the USSR Georgy K. Zhukov. Former US ambassador to Russia (2008-2012) John Beyrle told the story of his father’s odyssey from Normandy to Poland, fighting the Nazis on both European fronts. “We have seen a genuine thirst for greater people-to-people engagement and cultural knowledge about Russia among American students,” said Susan Carmel Lehrman, a long-time patron of the Initiative for Russian Culture, from which the Carmel Institute sprung. The initiative has already introduced thousands of US students to Russian food, music and movies over the past three years, with the help of the Russian Embassy in Washington and American University. The next step for the Carmel Institute will be scholarships and a degree program, said AU history professor and institute director Anton Fedyashin.